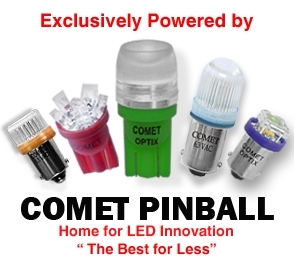 Thus, instead of offering just one pop bumper lighting choice, Comet Pinball offers many. I was able to get my hands on a few of Comet’s solutions to lighting the pops, and put them through the motions in a hands-on test. Mr. Rubin has been providing the pinball community with LED solutions since September 2013 and is a very active member of the pinball community as a whole (he can be found posting quite frequently on Pinside as “OLDPINGUY”). For a more complete look at Comet, you can read the interview Credit Dot conducted with Mr. Rubin in October of 2014. 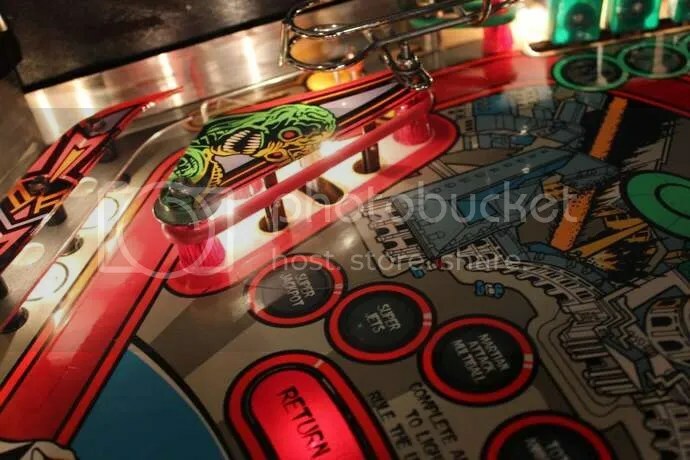 As you wade through the Comet Pinball catalog, you are bound to notice Comet’s newest pop bumper lighting option comes in the form of a disc, and adds to an already robust lineup of bumper lighting options. This review format will differ from that of the BriteCaps EVO review that appeared last week, for organization sake. Five different Comet products were procured for test. 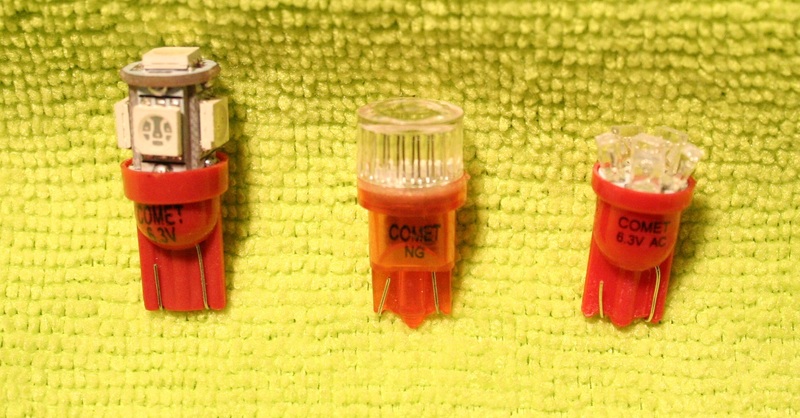 Traditional 555 Options from Comet (L to R): the 4+1SMD Tower, the 2SMD Faceted bulb and the 6LED Crystal Fan. Some folks may not be satisfied with the look that an SMD insert gives to their bumpers, so Comet offers a few options with a traditional 555 wedge base. For purposes of testing, I was able to play with three selections: the 6 LED Crystal Fan, 4+1 SMD Tower and the 2 SMD Faceted Lens Supreme Brightness No Ghosting bulb. Knowing that Pin*Bot would be the Guinea pig, I colour-matched all the options available to red. These options, while giving a more traditional centre-lit look to the bumpers, really do pack some power. If you are on a budget, or simply rally against non-traditional forms of pop bumper lighting, there are some options here for you. For less than five bucks you can bring brightness back to your pops. Of the three options I tested, I would absolutely recommend the 6LED Crystal Fan. It has a look that can’t be beat, while not being too harsh on the eyes. Despite being the only LED in the bunch, the LED “crystals” are arranged in such a way that it appears as the brightest option and disperses the light in both an even and far reaching manner. The 2SMD bulb really didn’t stand out in testing. The faceted lens worked to even out the brightness of the traditionally harsh SMD, but the light had to fight through that lens AND the pop bumper cap, thus appearing a bit tired as well negatively focussing the light source to a single area. The 4+1 tower, frankly, didn’t fit within the confines of the Pin*Bot pop bumper. Having restored the Pin*Bot, I had switched the socket with the flat wire leads out for the more reliable socket with insulated leads. The insulated lead socket doesn’t sit flush with the bottom of the bumper base, thus taking away a few millimeters, which the 4+1 Tower absolutely needs to sit properly within the base. The accompanying photo shows that the Tower had to sit at a 45 degree angle in order for the cap to fit. I tried the tower in a different game that had a socket with insulated leads, and the tower did fit, but the top SMD is so close to the clear bumper cap, that it prevents the light from throwing in a meaningful manner. The 6LED Fan is the clear winner here. The top pop bumper contains the crooked 4+1SMD Tower, the middle contains the 6LED Fan and the bottom contains the 2SMD lamp. Colour Palate: Blue, Red, Green, Yellow, Purple, Natural White, Warm White across all options. 2SMD Faceted and 6LED Fan adds Pink and Orange to the palate. Following in the footsteps of BriteMods BriteCaps, Comet Pinball began to offer their own pop bumper rings with the value you’ve come to expect from the Comet brand. While the BriteCap shipped with its own pop bumper cap, the Comet ring came bare, needing to be used in conjunction with your existing cap. The BriteCap and Comet Ring both carry 20 colour SMDs on the top of the ring to light the perimeter of the cap, one SMD in the centre at the base, and ten SMDs on the bottom of the ring to illuminate the playfield. The original BriteCap and Comet Ring vary in three ways: the inclusion of the bumper cap (as stated above), colour selection, and price. The colour selection allows the consumer to choose the colour of the ten bottom SMDs, either natural white or matched with the colour of the SMDs on the top. The Comet Ring comes in at $7.95USD per unit compared to $14.95USD per unit for a BriteCap that will produce a similar, if not identical, look. It is no surprise that BriteMods has moved away from the BriteCap design given Comet’s price point that comes in at half the cost (and have since focused on promotion and production of the BriteCaps EVO line). The 555 base is attached to the ring with two insulated wire leads. 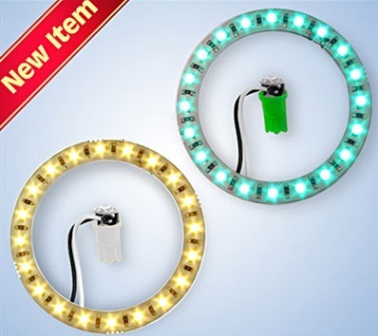 It is a traditional LED base with the dinky wires that need to be bent and shaped to make a decent connection. The construction of the ring is slight, but for good reason–when installed it gives a clean, dare I say “sharp”, look. I really like the results the Comet Ring brought in test. I had red colour-matched rings with natural white bottom lights for the Pin*Bot test, and a set of yellow colour-matched rings with natural white bottoms to test on Mousin’ Around. Given that the BriteCaps EVO, reviewed last week, adds 5 millimeters of height to the bumpers, I believe the rings are a suitable option for those games where clearance would be an issue. The ring nests neatly inside the pop bumper cap adding no height to the pop bumper whatsoever. The light design, while static and non-traditional, is an eye-catcher, especially for those who are used to the traditional, centre-lit incandescent look. I can remember seeing these in person on a game for the very first time, a Williams Diner, and I was completely taken by the pattern created on the bumper’s perimeter as well as the brightness it brought to the playfield from the bottom lights. The brightness control, adjusted with a Phillips-head screwdriver, works well to dial down the harshness for those with sensitivity to SMD lighting. I tested the rings at their brightest, with great results. A set of Comet Rings installed in Mousin’ Around. One caveat, and perhaps a major drawback of the rings, is important to mention. Seeing as the Comet rings ship as a stand-alone unit, with no pop bumper cap, it is important that you follow the instructions that Comet sends along with each ring order for successful installation. The rings can be very easily shorted on the metal ring and rod assembly of the bumper. If the ring is shorted, in some cases it will still light, but only at a fraction of its original capabilities. The rings absolutely need to be affixed to the inside of the cap before installation. I’m sure this was a problem for BriteMods, and that is why they ship their BriteCap with a pop bumper cap already attached. I’ll admit, one ring did short during test on Pin*Bot. I had used two dabs of hot glue to keep the rings in place, however it proved to be not enough on one of the caps I installed. I upped the points of glue contact to four for future applications, and have not had a problem since. I used hot glue so that the ring could be removed and replaced with other lighting solutions for testing purposes. It worked well and was fairly innocuous when used sparingly to the underside of the cap, but those that know Comet rings will be their permanent lighting solution may want to use a more permanent adhesive, making sure the selected product will not cloud the clear bumper cap (Krazy Glue or Gorilla Glue will most likely create that unwanted clouding effect, so be careful). Each Comet ring appears to be tested before it leaves company headquarters to make sure all rings are functioning properly upon shipment. There isn’t much that can be done to solve the shorting problem (short of shipping it pre-glued in a bumper cap), but it is completely preventable if consumers carefully follow the installation instructions. Colour Options: Blue, Amber, Cyan, Green, Red, Purple, Yellow, Warm White, Natural White. Bottom lights come in either natural white, or matched to the colour of the top lights. To be clear, the term “disc” is a term I ‘ve coined for the article. Comet offers the product by the name of “11 SMD Pop Bumper Light” but for clarity sake, I’ll call it the Comet Disc as a way to distinguish it from the other options. This is the newest pop bumper lighting option from Comet, and appears to be a cousin of CoinTaker LED’s AfterBurner line of pop bumper lights. The Comet disc is available in either a 555 wedge or a 44/47 bayonet base, making this option versatile for older machines that had 44 incandescent bulbs in the pops. The disc’s small diameter also makes it a viable option for Bally/Williams “Jumper Bumpers”, as found on games like Elvira and the Party Monsters. The disc has an outer diameter of 1 1/2 inches giving it enough surface area for the hardware mounted on it, but small enough to work with older or non-traditional style pop caps. The Comet Disc fitting perfectly in a non-traditional bumper cap: the Bally Jumper Bumper. The traditional base is affixed to the disc via insulated wires, much like the ring. The top of the disc features a large central SMD surrounded by six smaller SMDs available in a wide variety of colours, while the bottom has four natural white SMDs to light the pop bumper body. The discs do a good job of throwing light, looking akin to a disco ball when installed. I used colour-matched red discs in Pin*Bot for testing purposes. I’m not quite sold on the fact that the bottom SMDs “light up” the opaque pop bumper base with any real benefit. It is kind of a waste to have them on the bottom, expecially if your pop bumpers are tucked away in a back corner. I much prefer the bottom lighting on the Comet Rings that light up the playfield rather than the four bottom SMDs which end up being internal. The bottom SMDs may be a feature more beneficial for older games with stand-alone pop bumpers placed in plain view rather than nested under ramps or behind a maze of wireforms. Again, Comet has included a brightness dimmer with this product to reign in the harshness of the SMDs. I found the colour to be more rich when dimmed a bit, rather than leaving it at full brightness. 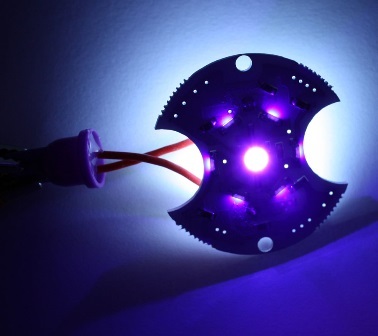 The disc wins in terms of value, lighting your pop bumpers with an SMD flare for less than $15USD for a set of three. However, for an extra five bucks you can get yourself into a set of Comet rings that will really catch your eye. Colour Options: Blue, Red, Green, Orange, Yellow, Purple, Cyan, Warm White, Natural White. Bottom colour is natural white across all colours, except natural white which comes with a natural white bottom colour. Out of all of the options, I liked the look of the 6LED Fan lights in Pin*Bot the best, and will probably stick with them going forward after I’ve tested all the products in this series (bolster them with the Pinball Life-supplied “Nordman’s Sparkly Pop Bumper Enhancement Thingy” and it will really make them pop). The rings and the discs both took too much away from the plexi Bride playfield that sits atop the pops. For me, a more traditional look (while taking advantage of modern technology) was necessary. Those looking to light their pops on a budget, I’d highly suggest the fan option from Comet. A 2SMD in the top pop bumper, a Comet Ring in the middle, and a Comet Disc in the bottom. When it comes to a showdown of Ring against Disc, I’d have to choose the Comet Ring on looks alone. I’ve shown the photo of the rings installed on my Mousin’ Around to a few people in my local pinball community and they’ve given nothing but positive feedback. It’s a completely different look than traditional lighting options, and gives a splash of light onto the playfield from the ten bottom SMDs that you don’t get with the disc. If you can look past the fact that you’ll have to install the rings with the utmost of care, it is an option that offers a lot of value as compared to other upscale pop bumper lighting options on the market. The ring is a bit of a non-traditional choice, as it lights the perimeter of the pop bumper and leaves the middle somewhat bare (save for a single SMD at the base). The disc is the opposite, lighting the middle and leaving the perimeter unlit. In the end, while costing less in the long run, I don’t think the look of the discs are for me. The Comet Ring offers a “cleaner” overall look. 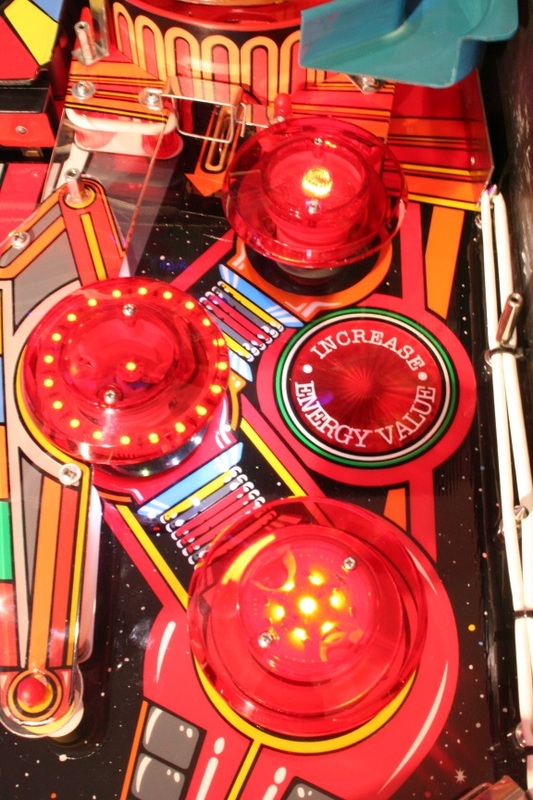 I’d welcome a Comet Pinball product that takes the perimeter lighting of the Ring and the centre lighting of the Disc and fuses them into one lighting solution, much like BriteMods has done with their BriteCaps EVO line. If nothing else, Comet Pinball’s dedication to choice and value really shines through, offering a multitude of pop bumper lighting options to satisfy any pinball enthusiast’s desires at a price that won’t hurt your wallet. Credit Dot Pinball/Comet Pinball Contest! Two Comet Pinball prize packages are up for grabs. The prizes were generously donated by Art from Comet Pinball. Two randomly selected winners will receive some of the products that were tested above, along with some other exclusive Comet Pinball wares. To enter, simply send an e-mail to creditdotpinball@gmail.com with the word “COMET” in the subject line. One entry for the Comet contest per email address please. If you entered the first BriteCaps EVO contest, please enter this contest, too! Two winners will be picked at random (using random.org). Contest closes June 30, 2015 and winners will be announced shortly thereafter. Open to residents of the US and Canada only…I’d love to open it up, I can’t afford to ship stuff overseas! Categories: Review | Tags: Comet Pinball, Elvira and the Party Monsters, Mousin' Around, Pin*Bot, Pinball, Pinball Life, Pop Bumpers | Permalink. Quite a lot of Bally System 11 games have dented side rails. It’s almost an epidemic. Read any For Sale description of an Elvira and the Party Monsters, and more often than not, you’ll get a mention of damaged side rails from an errant backbox drop. They seem be dented and left unfixed in high numbers due of the lack of new (or NOS) replacement rails available in the marketplace. The rails are an oddball size and only appeared on a handful of games, so parts manufacturers have neglected making them. Drop the backbox and dent the rails on your WPC machine and it’s a $50 mistake that is easily remedied with an order through Pinball Life. Dent the rails on your Mousin’ Around? You’re pretty much screwed. The dents will be a constant reminder of your stupidity. Might as well get out the hammer and try to bang out the damage, because these rails are pretty hard to source. The games bearing these rare rails are Truck Stop, Atlantis, Transporter: The Rescue, Elvira and the Party Monsters and Mousin’ Around, and the reference number for the elusive part is A-12359-1 (the parts catalogue mentions that Bally Game Show may also use these rails, however, I cannot find definitive photographic evidence of this–Game Show was the first Bally game to employ the external rounded hinge, which leads me to believe a different shorter rail was used. If you have leads, or photos, please let me know.) All of the above mentioned games were manufactured under the “Midway” banner (despite bearing the “Bally” name on the backbox) during a time when Williams had just absorbed the struggling Bally/Midway brand. The rail length for these games, from end to end, for a System 11 Bally Rail runs 51.5 inches, making it nearly 5 inches longer than the identical looking in every other way WPC side rail (A-12359-3). The reason for the extra length is that the backbox on these five Bally games sits on a built-up pedestal of sorts, and the side rails run underneath the backbox to the backside of the cabinet. The hinges on the backboxes are not external, but rather contained within the backbox pedestal, allowing the rail to run undisturbed to the rear of the cabinet. Bally games that followed Mousin’ Around had their backboxes sit flush with the cabinet and employ a set of external rounded hinges (similar to other late model Williams System 11 games), thus the side rails had to terminate at the backbox. 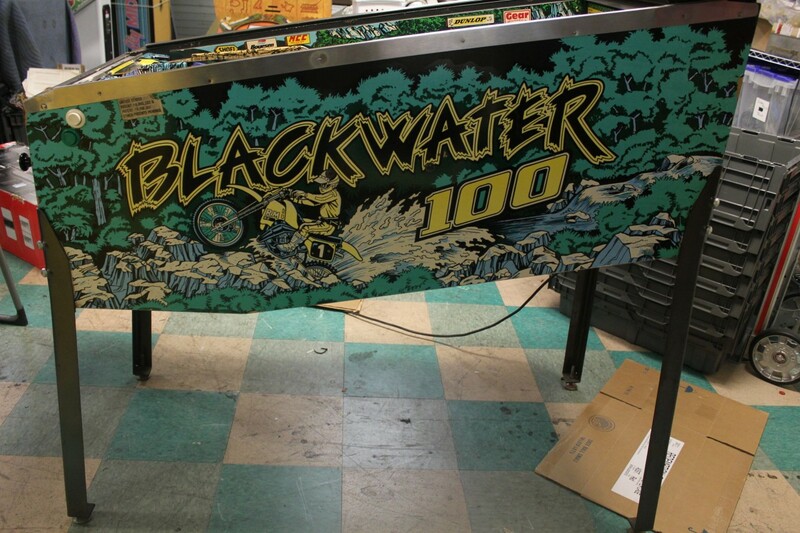 (It is interesting to note that Bally Midway’s March ’88 release Blackwater 100, pre-Williams takeover, appears to be the first “modern game” with the thinner and longer 51.5 inch rail incorporated into the design, however, this version of the rail is affixed to the cabinet with a series of nails running its length, whereas the later version of the rail we are speaking about here is affixed to the cabinet with double-sided tape, a Torx screw on the back end and a bolt on the front near the flipper button.) To complicate matters more, rails on the games from the same era bearing the Williams logo, such as Fire!, Earthshaker, Jokerz! and Black Knight 2000 to name a few, were wider in height and incorporated the flipper button right into the rail itself. You could almost cut two thin Bally rails out of the metal used on one of the Williams games. 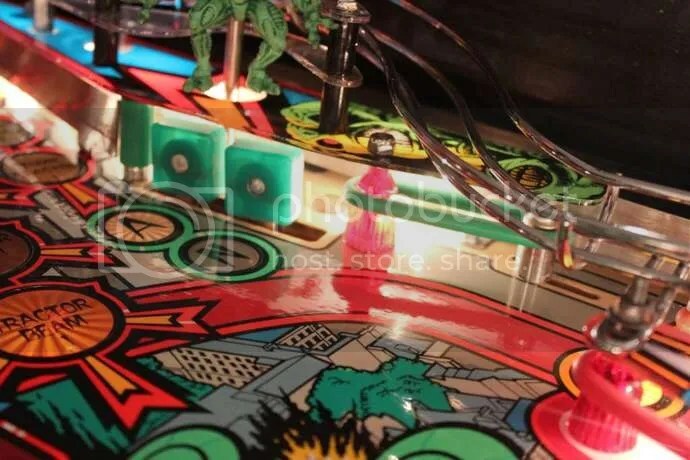 Less metal meant cost savings: thus, it should come as no surprise that Williams adopted the thinner Bally-style rail when a standard design for all pinball machines was adopted for the WPC platform in the 1990s. The 51.5 inch “Bally Rail” in question. Rail terminates at the rear of the cabinet, hinge system hidden in the backbox base. Elvira and the Party Monsters, 1988. The 51.5 inch double high Williams rail which enveloped the flipper button. Note the use of nails. Like the Bally games, the backbox hinge was internal and incorporated into the pedestal design. Pinbot, 1986. Shorter Williams rail that terminated at the backbox. Note the move to the external hinge. Rollergames, 1990. A quick search shows that Bay Area Amusements has the A-12359-1 rail advertised on their page for purchase; however, like many other desperately needed niche parts listed on their site, they are currently out of stock. I have checked the page for the last five months, and I have never been lucky enough to find the item available for immediate purchase (if in stock, retail price would be $59.00USD+shipping). The Ministry of Pinball, the Netherlands-based pin retailer, also lists the rails for purchase (retail price: 29.95 Euro), which remains an option for our Euro friends, but those stateside would pay dearly for shipping due to the awkward size of the parts (you’d have to add another 35.00 Euro for shipping to the US or Canada…it gets cost ineffective pretty quick). In some rare instances, the rails do pop up for sale. Not two months ago, a set was offered, and quickly purchased, on Pinside for $125USD (shipping included). A search of the rec.games.pinball newsgroup shows that a few sets have sold over the years with the asking price ranging between $150USD-$200USD. RGP also mentions the existence of a user named “Timathie” who manufactured the rails for the RGP community years ago. As per a post from 2011, it appears that the user is no longer making them. Original seller’s photo showing the dented rails. Top: damaged rail, Middle: cut rail ready for install, Bottom: trimmed excess. Categories: Hardware | Tags: Atlantis, Bally, Bally Game Show, Bally Midway, Elvira and the Party Monsters, Mousin' Around, Pinball Life, Side Rails, System 11, Transporter: The Rescue, Truck Stop, Williams, WPC | Permalink. 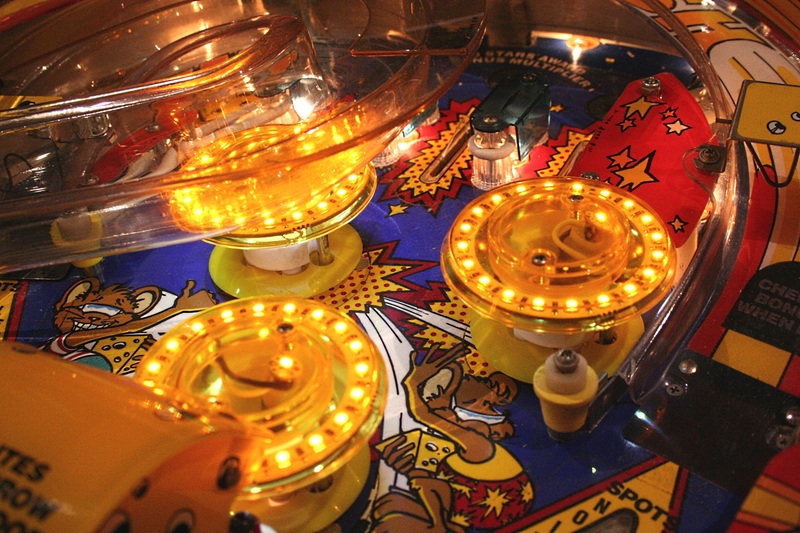 There are a lot of familiar sites online from which to order your pinball parts. Pinball Life. Marco Specialties. Bay Area Amusements. These are the big players. The established names. 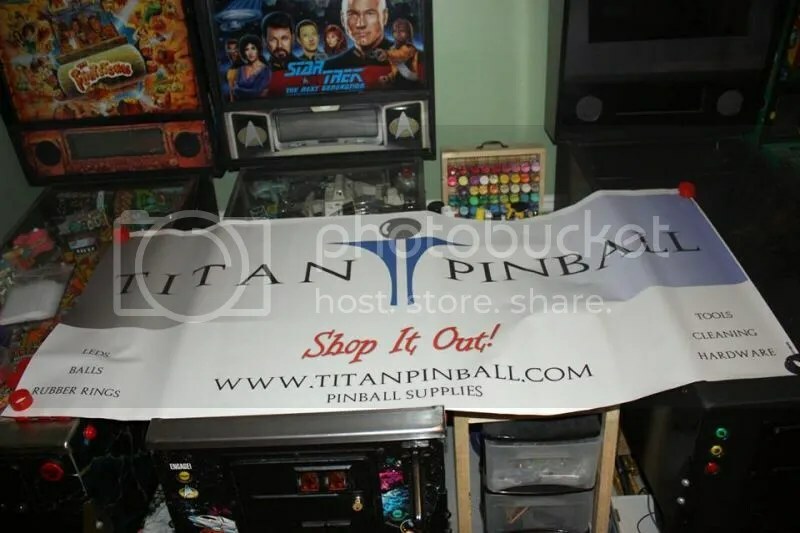 But today we are featuring a newcomer to the pinball supply scene, Titan Pinball. This Georgia-based company, run by the husband and wife duo of Matt and Eve, has just begun providing collectors with all the parts and supplies needed to “shop out” their games. As of press time, the breadth of items in their webstore is rather limited, but it is a supply that is growing daily. They do have a hook–they offer a full line of coloured rubber rings, allowing almost endless combinations of customization for the machines in your collection. I got the chance to ask Matt from Titan Pinball a few questions about throwing himself completely at the business of pinball supply and his plans for growth in the future. Credit Dot: The Titan Pinball story begins after the company you worked for closed up shop and you became jobless. You decided to follow the course of action pinball enthusiasts only dream of: opening your own online pinball store. Was it nerve-racking making the initial decision? Matt from Titan: The initial decision was more whimsical than anything. It just came up in conversation over dinner one evening. I didn’t really want to pursue a living in the same industry I had worked for the past fourteen years. What else could we do? How about pinball? The actual process of starting the business was beyond nerve-racking. CD: Who are the members of the Titan “team”? MT: I am the owner. My wife, Eve, is my supervisor. 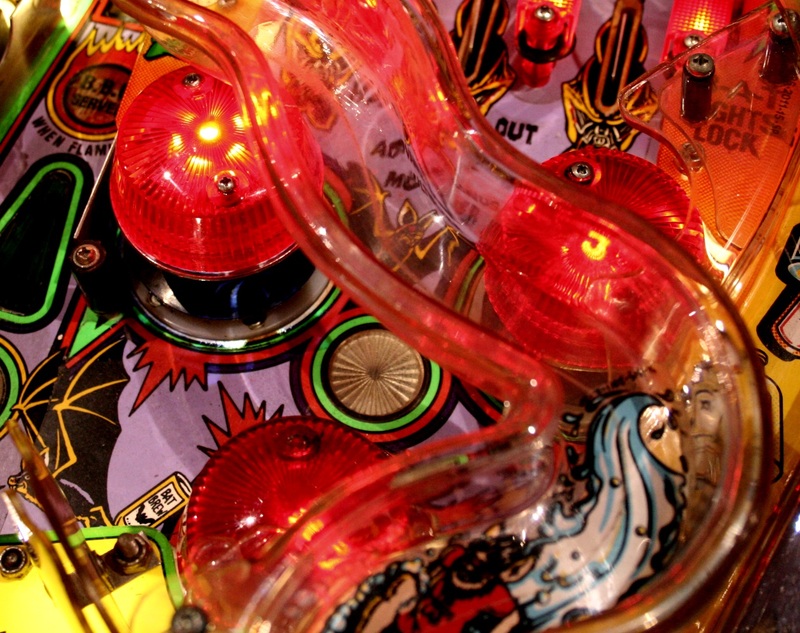 CD: How did your relationship with pinball begin? What are some of the earliest games you remember playing? MT: My first pinball experience was with my father in the early 80s. The local arcade had four or five machines. He would play pinball while I defended the earth from Space Invaders. Eventually, he persuaded me to give it a whirl. Eight Ball Deluxe is the first game I ever really remember playing. I recall being very frustrated by the difficulty of pinball and didn’t give it much of a chance. In the 90s, I was reintroduced to pinball through a popular college game room. They had (although I was unaware of it at the time) a great lineup of machines that constantly rotated in and out. The Addams Family, White Water, Junk Yard, Funhouse, Scared Stiff, and so on. I loved playing them, but lacked any real skill. The only way a replay was coming my way was through a match. It wasn’t soon after that pinball machines began to disappear on location. After a year or so, other interests had my attention and it would be fifteen years before I would enjoy playing pinball again. CD: As for your business, how difficult is it to maintain competitive pricing? Do you always have your eye on other retailers’ websites? MT: We try to stay up to date on competitor pricing. It’s very difficult to compete due to the volume in which larger stores purchase. We buy in volume whenever possible and, at least for now, have a low overhead which lets us sell at comparable prices. CD: I’ll bet you’ve done your fair share of counting out quantities of hex screws and lock nuts! CD: Do you have a facility you work out of? Or is your basement filled with pinball supplies? MT: We work in an area that was formerly known as the living room. There is pinball machine in the kitchen, one in my office, and another under the stairs. CD: How have you used social media and community-oriented websites such as Pinside to promote your store and connect with your customers? MT: It’s a must when you are a small company in a smaller hobby. Other than “supervisor”, one of my wife’s other titles is “Social Media Manager”. So far, the response has been very positive and we have met a lot of friendly individuals in the pinball community. CD: I hear international orders can be a bit of a headache. How are you handling shipping across borders? MT: Shipping is a nightmare in general. We are still small enough to where each order can be given individual attention. Most overseas customers contact me through email first to discuss the shipping price before hand. We don’t like making money on shipping, so we always refund any overage. 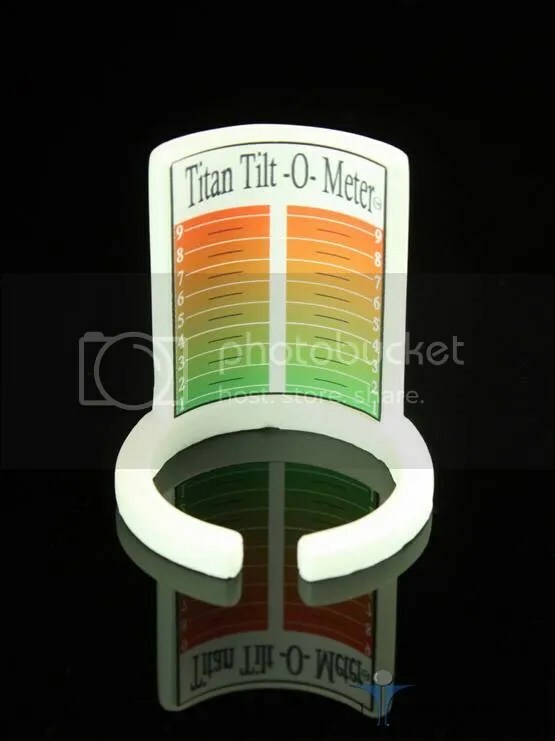 CD: Can you shed some light on how the “Tilt-o-meter” came about and the manufacturing process? MT: Out of the blue. We were working on the Flintstones with the playfield up when I happened to look down at the tilt. I wondered how hard it would be to have all of my machines set to the same sensitivity. The first Tilt-o-Meter was a piece of paper taped to the tilt mechanism. Then came the idea for a small device. After struggling with 3D printer software for a few days, I sent the model to be fabricated. We realized 3D printing was great for a prototype, but not really conducive for volume production. This gave us a great excuse to play with silicone molds. After much trial and error, we finally made a mold that works relatively well. We cast in resin, pop them out, sand them, and apply the label. Voila, you have a Tilt-o-Meter. CD: You have complicated the age-old argument of white rubber versus black rubber buy selling six different colours of rubber rings plus the standard black and white. Are you the only company currently offering coloured rubber? MT: As far as we know. Although I doubt it will be too much longer before someone else manufactures them. CD: These rubber rings are made exclusively for Titan Pinball. How involved are you in the manufacturing process? MT: Very. It’s been a year since we sent the first e-mail to a rubber manufacturer. There are always samples being sent back and forth–tweaking the color or the hardness, and trying out new companies. While we are happy with our current lineup of rings, there is always room for improvement. CD: Do you assure the same feel and bounce as standard white rubber? MT: No, primarily because of the different number of manufacturers being used in the industry. Some parts suppliers have their own formulas, while others rely more on NOS rings made several years ago. We looked more toward consistency throughout our product line. We order in Shore A 45, which is a relative equivalent to red flipper rubber. CD: This innovation was a long time coming for a community ravenous to make their machines unique. Why has it taken so long for coloured rubber to hit the market? MT: I think it was primarily due to the logistics of creating kits, and the possibility of offering too many choices and overwhelming the customer. CD: Super-bands and Saturn Rings, two prominent flipper “rubber” innovations made with synthetic rubber, have been met with mixed reviews. Some claim they modify ball movement in undesirable ways, thus negatively changing the way a game plays. Others like the control the rubbers give. What is your opinion on these synthetic flipper bands? MT: I think the new rings types are a much needed innovation for pinball. Whether or not you are a fan, it’s a new feel and it can change your experience with a machine. I believe that’s a positive thing. Coincidentally, we were toying around with a new rubber type a month or two before the urethane rings were announced. We only had the funds to bring in one type, so we stuck with the regular rubber. Currently, we are working with a new manufacturer to bring in a full line of silicone rings. We’ve given prototypes to a handful of players, and so far the response has been very positive. CD: Will you eventually sell ring kits or will you leave it to the customer to compile their own? MT: That has been the question from day one. We struggled for months trying to figure out how to make it easy for the community to get a kit with so many permutations of colors. Hopefully, we have found the solution. We are a week or two away from introducing a public, crowd-sourced database of rubber ring and led kits. Users will be able to easily make their own kits, upload photos, and tweak other users ideas. Eventually, these kits will be tied into product SKUs of any pinball supplier that wishes to participate. It’s hard to say whether or not it will work, but we are very excited about it. CD: Looking at your sales figures, what is the most popular rubber size thus far? And the most popular colour? MT: 2 and 2 1/2 inch. The most common slingshot sizes. I’d say red and blue have been the most popular, with purple a close second. CD: Are there any new colours on the horizon? MT: We hope so. If we continue to do well we’d like bring in some silver/grey, different shades of our more popular colors and, of course, hot pink! CD: What items are you looking at adding to your stable of products in the future? MT: Certainly more plastics, such as lane guides and pop bumper caps. We are already negotiating standoffs and mini-posts, as well as flipper rebuild kits. It’s still a little while off, but they are high up on the list. CD: What games are currently in the Titan Pinball collection? MT: We currently enjoy a Flintstones (our first restore), Star Trek: The Next Generation, Tee’d Off, and a Virtual Pin the wife and I built. CD: To close, what advice you can give to others that are thinking of giving up their day job and turning their pinball passion into a business venture? MT: The same advice I was given: Don’t! If you get into a pinball related business, you had better be doing it for the love of your hobby. It’s long hours for little/no pay. Having said that, I can’t imagine doing anything else. It’s a passion, and we love it! It’s also mandatory to have a wonderful and understanding significant other. I am fortunate enough to have a fantastic wife, without whom none of this would be possible. Please visit Matt and Eve at http://www.titanpinball.com. They can also be found at this weekend’s Southern Fried Gameroom Expo in Atlanta, GA. Categories: People | Tags: Flintstones, Onine Retailer, Pinball Life, Pinball Parts, Rubber Rings, Saturn Rings, Super-Bands, Titan Pinball | Permalink. With Allentown just behind us, and all my money spent on the treasures there, I didn’t think that I would be able to get another pass from the family to head out to Clay Harrell’s grand opening showcase weekend of the Vintage Flipper World outside of Ann Arbor, MI. I was able to float the idea past my wife guised as a relaxing weekend away–-a weekend where our son would stay with his grandpa. To my surprise, she agreed! Probably because she saw the excursion as an excuse to shop while I spent the day playing pinball. Regardless, I’m planning to attend the Saturday event! I’ve referenced Clay Harrell’s VFW project on this site a couple of times already so I won’t rehash the rich history. Just know that Harrell has filled an old Veterans of Foreign Wars (VFW) hall with 190 pinball games from every era and re-named the place the Vintage Flipper World (still VFW…I see what you did there). The details: The showcase runs Friday May 16 5pm-10pm, Saturday May 17 10am-9pm and Sunday May 18 10am-4pm. Tickets are offered on a first come, first serve basis and are available here. Payment can be made through Paypal, and a printed Paypal receipt is required for admission. Friday and Sunday entrance fee is $20, while Saturday runs you $25. With Saturday’s ticket comes an entry into a draw for a Bally Odds and Evens pinball machine. You need not be there in person to win. Clay limited the number of patrons in the venue to not only control crowds, but to keep the lines short on the more popular games. The Saturday ticket is a hot commodity, so buy it fast if you plan on attending! The games: This list is here. It is extensive. There are going to be complaints from almost everyone that their favorite game of a particular era isn’t present. That said, I’m going to complain in the most positive way possible! I’m surprised that Centigrade 37 and Volley do not make the cut in the 1970s category…then again, those are pretty popular games you’d be able to find at a friend’s place or on a league night (I know of three collections within 45 minutes of my house that have a C37, so there you go). The Bally solid-state lineup is impeccable. The System 11 collection hits all the high spots, however notable from their exclusions are Earthshaker and Dr. Dude. Since I’m a fan of this era, I wish more games that are unique for their rarity were present (Transporter: The Rescue, Radical! )…because using the above EM scenario, I can play a High Speed or F14 Tomcat nearly anywhere, but my chances of finding a Radical! is very limited. The DMD era games make up the bulk of the collection and its a pretty complete smattering of favourites and rarities (including a Safecracker and a Cactus Canyon). The tournament (if you can call it that): Clay is de-emphasizing tournaments at the VFW. No world rankings, no whopper points, no hefty buy-ins. Certain games will be declared tournament games and if you drop a quarter in, you have entered the tournament. Highest score at the end of the day gets all the money in the coin box. Clay & Co. have the right to disqualify anyone they deem a “pro” or “ringer”. This is a very bold move. In essence, this show is for collectors, casual players and pinball connoisseurs, not for “pros” who spend hundreds of dollars to qualify to win a pot of $250. The swap meet: The VFW site has plenty of room for folks to come and show off their wares. Vendors are encouraged. Parts guys from Pinball Life and Pin Restore will also be there. The venue: As a Kickstarter backer, I got to see pictures and videos of this venue throughout its various stages of construction, and it looks to be the perfect place for a pinball showcase such as this. The venue is over 6000sq/ft and includes a pinball workshop on site. Surrounded by acres of land, there is plenty of room to barbecue or camp for the showcase weekend. The venue is located on the outskirts of Brighton, MI–at 8891 Spicer Rd, Brighton MI, 48116. Lodging available in nearby Brighton for those coming from out of town. From Clay’s comments to Nate Shivers the other day on Coast2Coast Pinball, I fear this may be the only chance, or one of very few chances, we get to explore the wonders of the venue and its treasures within. It is cleared to open four times a year, yet Clay pretty much came out and said they would only be open once this calendar year, and left a big question mark if it would even maintain a yearly schedule. One can only hope this the opening weekend is a success. For me, the three-and-a-half hour drive is a drop in the hat to play some rare games, and some favourites too. 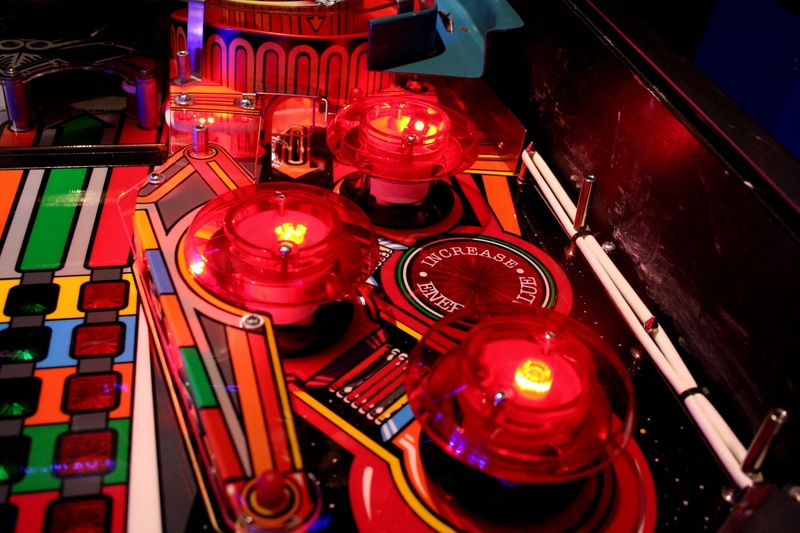 For pinball starved aficionados in Michigan, Southern Ontario and Northern Ohio, excitement should be high for this type of event. Categories: News | Tags: Centigrade 37, Clay Harrell, Coast2Coast, Dr. Dude, Earthshaker, F14 Tomcat, High Speed, Pin Restore, Pinball Life, VFW, Vintage Flipper World, Volley | Permalink.